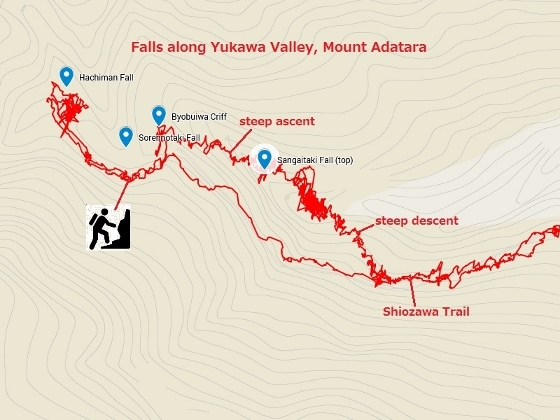 Today, I hiked along Shiozawa Trail of Mount Adatara, expecting to encounter large falls, hopefully with changing autumn colors. 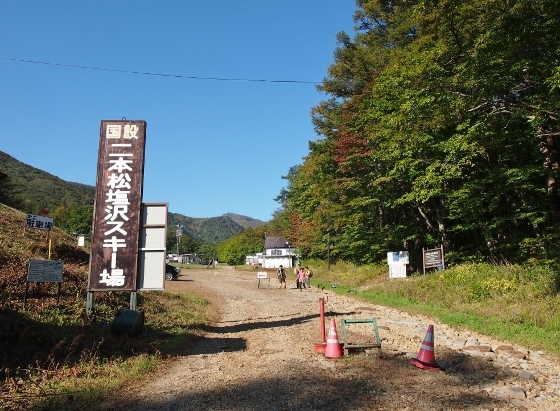 Shiozawa Trail starts from eastern part of the mountain, where Shiozawa Ski Slope exists. A local bus service takes you to the start point, the bus terninal of which is named "Shiozawa Onsen". Hiking on the trail toward west, you can find three large falls one after another along the way. 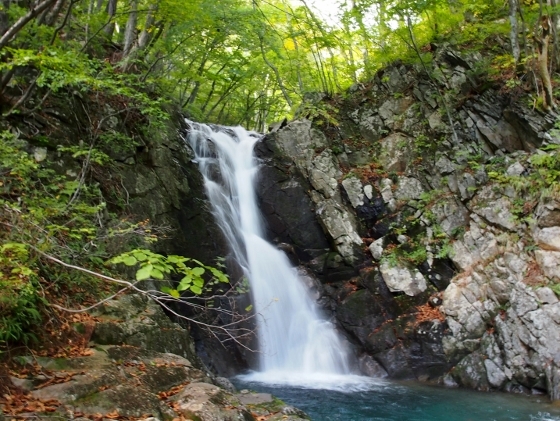 A photo above is the last one called Hachiman Fall located about 1100m above sea level. It showed beautiful scenery, although the autumn colors were not just enough. Local people said about a week ahead wound be the best time to see. A photo above is of magnificent Sorennotaki Fall viewed across from Byobuiwa Cliff which is located about 1080m above sea level. This was the second one I encountered. 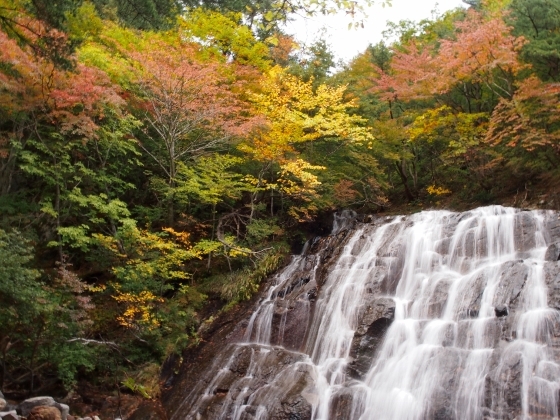 The Japanese name Sorennotaki means think-of-love fall. 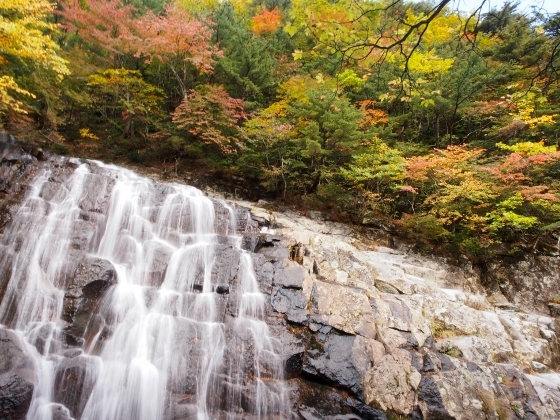 This is one of the falls I met first, which is called Sangaitaki or three-story fall. This fall is located 50m below the original trail, so you have to descend a very steep slope almost by sliding with sitting pose. And then you have to climb up again the rocky slope toward Byobuiwa Cliff. The three-story fall could not be seen at once. The photo above shows the top one at the highest. 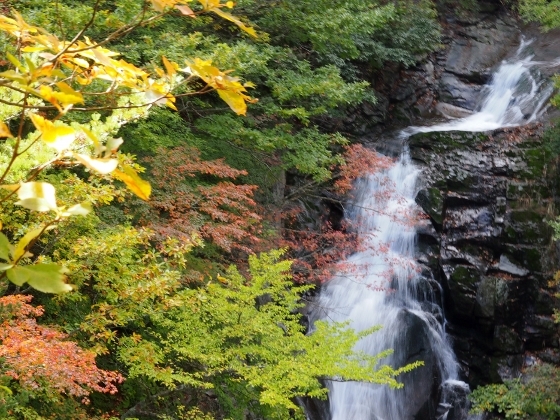 Another photo of Hachiman Fall is shown above with different angle. After visiting these falls, I returned back the trail to the start point which is shown above. About 15-minute walk down the road from there, there is a hot spring inn called Aokiso as shown above. 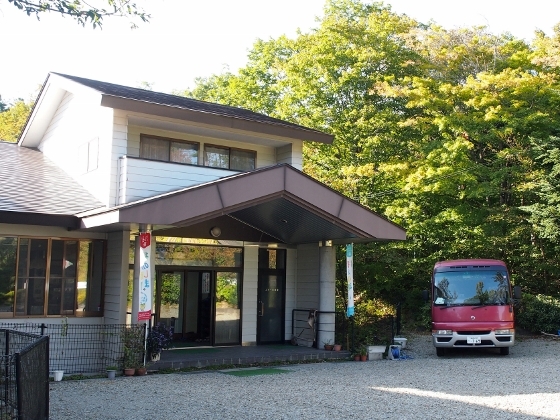 Today, this is the only hot spring inn which belongs to "Shiozawa Onsen" or Shiozawa hot spring site. The simple alkaline hot spring water wells out with lower temperature of 37.5 degree Celsius. So the hot spring water has to be warmed up. I tried this hot spring for the first time and it was very good, though the water was circulated with filter for disinfection and was not overflowing from bus tub. The master of the inn was very knowledgeable about Shiozawa trail, being one of the members maintaining the trail.